Our little stars dig through the final chapters of Belkan history. Knowing how things came to an end didn’t seem to soften the blow one bit after we got to know more of the lives of Olivie, Claus, and Jeremiah. 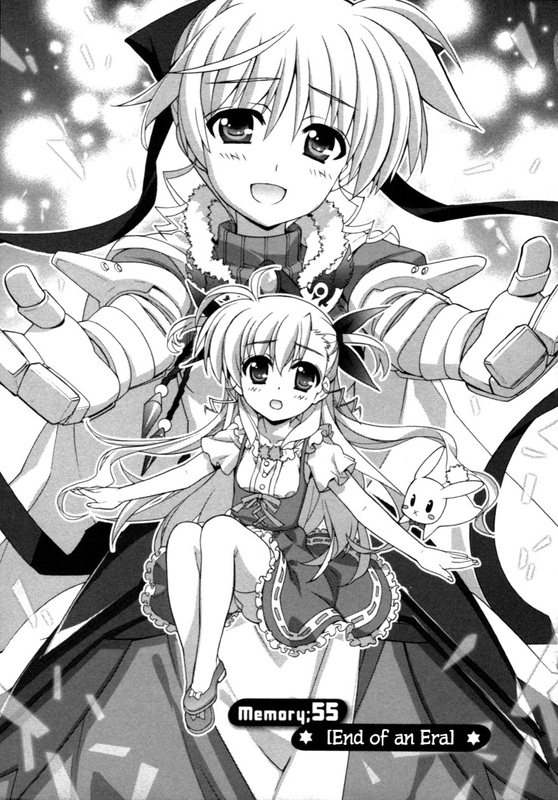 This entry was posted in Nanoha ViVid, Releases and tagged mahou shoujo lyrical nanoha vivid, nanoha vivid, scanlation, ViVid Translations. Bookmark the permalink. I needed that last page after reading that chapter. Indeed, knowing what was to come is no substitute for seeing it actually happen. The only comfort is knowing that their descendents are able to reunite in a time of peace. I’m still gonna wait till the other chapters HQ releases, but I can already feel the feels that wait in store for me. Great, thanks for the translation. There really is no reason for you to wait. Even though we called them LQ, the quality isn’t bad or anything. It’s just that things weren’t redrawn and there might be some chinese sound effects in there. Whoops, I’m getting ahead of myself again. 56 is in the pipeline. Ancient Belka really was a wretched place. As cool as their warriors were and battle system still is, the world is a better place under TSAB and the Midchilda culture of administration. Ending seems a bit abrupt? Is the “for now shall we return above?” page really the last page in the chapter? It just feels like it would have been more in line with this manga’s style to have included everyone responding to the question as the final page, or something. Believe it or not, that really is how the chapter ends. The next one will pick up right after it as the girls had a lot to take in and think about. Huh. Well, I suppose in some sense leaving us with things feeling a bit unresolved like that works, as the girls themselves, as you say, have a lot of thing they’ll need to think about and resolve, both for themselves and between certain members of the group. Dammit… I told myself I wouldn’t. It’s just the onions. Yes, the onions! Yeah, I honestly would prefer to see the chapters cleaned up you know? Which is why I’d rather wait for the hq releases, just my preferences.